I cannot believe The Thursday Seven is upon us already! This week I took a topic I could literally write a book on. I think I might have had 20 ways to keep it healthy before stopping myself (I could have gone on) and shrinking my list down to seven! No matter where you are in your health and fitness journey going out to eat can sometimes be a daunting, anxiety filled, and stressful process. Trying to stay on a healthy balanced diet with temptation filled menus can make a hermit out of anyone. Here is a list of 7 ways you can stay on track and still enjoy a night out. 1. Avoid big chain restaurants and fast casual restaurants where food is remade and shipped in. These foods are pumped with high levels of preservatives, sodium, and who knows what else! Look for scratch kitchens where you can customize your order. 2. If you plan on bread skip dessert, if you plan on dessert skip the bread. For dessert try a healthier option like fruit with whipped cream. 3. Ask for a box with your meal and box up half of your meal if the portions are large. Better yet ask if they can box half for you prior to bringing out the food that way you will not be tempted when you see your entree in all it’s delicious glory. 4. Stick to small plates or an appetizer or two depending on the size and a healthy side like steamed veggies, side salad, or baked sweet potato (be careful on those toppings). 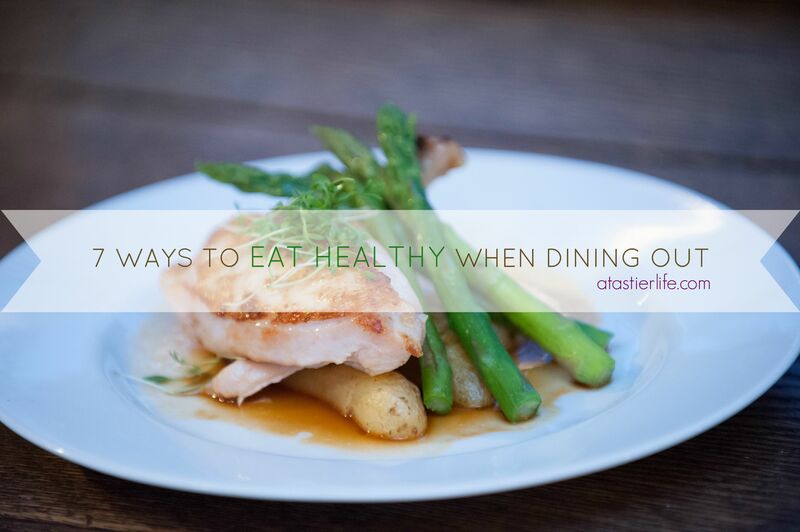 5.Stay away from creamy dressings. Look for vinaigrette options, oil and vinegar, and ask for these on the side. 6. Look for protein that is or can be broiled or grilled. Ask they go light on the salt when seasoning and if you are feeling really confident ask for your chicken or fish to be broiled in water. 7. Take a look at the menu prior to arriving so you have an idea of what their healthy options are. I always find this to be extremely helpful. At times this will take certain restaurants off the list of where to go. There is nothing worse than getting to a restaurant and realizing it is of a certain cuisine where absolutely everything is fried, contains cheese, loaded with carbs etc…if there are absolutely no healthy alternative skip this place. Stay away! Unless you are on a treat day and are o.k. with those options for that given day. BONUS: Be careful when attending events that consist of buffets and h’ordeuvres. This scenario is a perfect example of when to eat a snack or an entire dinner at home prior to. This is especially hard for me and if I could ask my husband to tape my mouth shut while attending without looking absolutely ridiculous and not being able to talk to anyone I totally would. I love talking about all things health and fitness so PLEASE comment with any questions, tips, or Thursday Seven topic ideas. Previous Post The Stairs To A Healthier Body!